One morning, our youngest woke up and informed me that he would no longer be wearing a diaper. I was not ready to begin potty training, especially with a long road trip coming up, but I didn’t want to miss the opportunity, so we were off to find some big boy underwear. I am a mother to three of the worst sleepers! They all three still wake up several times every single night, and none of them like to sleep in their own bed alone. But, maybe because God took pity on me for having such difficult reflux babies, and non sleeping children, he gave me some of the easiest kids to potty train – and for that I am SO thankful! So I don’t know who deserves the most credit, God, my motivated children, or me and my little tricks, but together it all seemed to work. 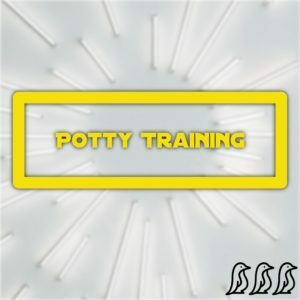 To be honest I don’t know if I am qualified to share what I think helped my kids (because who knows if it even worked), but incase any of this did the magic, I thought I’d share what we did to potty train three times in a row. 1. The child has to be ready! I understand that every parent eventually hits a point where they are done with the diapers. But, I know through other experiences, that it is very hard to train a toddler something new if they are not ready. And, it’s very frustrating when they just simply refuse. I know most kids don’t wake up like my boys each did and state that they are now ready, but if the child is not showing signs that they are into using the big throne, then I think we need to be careful about pushing for both their sake and our own sanity. With our daughter it started in baby steps. First I bought a book about big girls using the potty and bought a little toilet that I placed in the family room. For about a week she would sit on it as we read books, and she would set her dolls and stuffed animals on it (I promise it was clean and unused). Next we moved it into the bathroom and I would encourage her to try to use it whenever she woke up, or before a bath as I started running the bath water. We also had fun buying some new big-girl underwear that she eagerly helped to pick out. Once she seemed comfortable with the potty and had used it a few random times, I picked a week and cleared our schedule. The first morning we woke up she put on her big girl underpants and we made as big of a deal about this as we possibly could! And that first day she had 12 accidents, but I stayed positive in front of her, and the next day she had only 6. By the third day she was doing great and we even left the house on the 4th day for a small amount of time. Since we picked the Easter break to do this, it gave us a full week to focus on just potty training before returning to preschool. And when she did return, she did really well! It’s easy to give up. Like I said, the first day I potty trained my daughter she had 12 accidents and I cried (but of course not in front of her). The second day 6, and the third day almost none, and after that she was a champ! For both my boys it was even less of a mess. Each of them woke up one morning and decided on their own that they were doing this, they were really ready (I think it helps having an older sibling(s)). But, if at any point I would have said it was too much to deal with and put them back in a diaper, I’m sure it would have only crushed their spirit and in the end made the entire milestone a negative one. Obviously if an unfortunate circumstance presents itself you may need to go back to the diaper. But just understand that you now are running the risk of confusing them, and losing any of the progress you made. So once you commit to putting on the big kid underwear, I strongly encourage you to just stick with it! First, let me clarify, underwear during the day, diaper or pull-ups for sleeping. For some kids it takes years for them to hold it in their sleep. It took our daughter only a couple of months, but for our one son it took over two years. But I highly recommend underwear for during the day from the start. For our daughter I tried pull-ups for a few weeks with no luck. Once I switched to underwear she trained in 3 days. I have since done a lot of reading and it seems that the underwear, or even no underwear, works best. Yes, there is more of a mess to clean up, but kids really do not like the feel of pee running down their legs. They very quickly learn to use their muscles to stop the flow which eventually turns into holding the urine all together until they can make it to the potty. Which is why you need to expect accidents and allow them these feelings to properly learn the steps. Pull-ups or diapers do not allow for these experiences and will make the entire process take much longer. For my daughter we set up a sticker chart. Each time she went she got to put a sticker on the page, and when a row was filled up she got a lollipop. Our son Carter decided he was ready one morning shortly after we had just had our third baby. I was in no way ready to deal with Potty Training while caring for a newborn, but not wanting to discourage him I chose to follow his lead. Because I was unprepared we never got a special boy potty or book, and he never got a reward chart either. But my daughter’s old Tinkerbell potty seat on the big potty and a few M&Ms I had on hand did the trick and within a couple of days he was all set. From time to time there may be an occasional set back. Maybe if your child gets sick, goes through a difficult situation, you go on vacation, or if he/she just gets too distracted playing, they may have an accident. But it’s just that – an accident. And it’s OK. It’s normal. Just stay positive and go back to the basic talks that you started with. I’ve read that in some cases children can still have challenges up through age 10. Their bodies are still growing and changing. Obviously if you are ever concerned speak to your doctor. But please, for the sake of the child, try to remain as positive as possible! Eventually it will click and eventually they will learn to use the potty. Like my wonderful pediatrician always says “they wont go to college like this.” Eventually they will be done with diapers. So for all you mamas that have been through this – great job!! And for all of you about to embark on this adventure – Best of Luck!! Just don’t give up, stick with it and remain positive!